This grove of aspens jumped out in front of my camera in 2007 during a trip to Arizona. We had spent a week in Tucson, then stopped for a few days in Sedona before heading north through Flagstaff toward the Grand Canyon. It was a great trip, one of our best getaways. Northwest of Flagstaff, we drove into the snow. It was a sunny day, but cold. Being Texans, who don't see much snow, we had to stop and play a bit. We had just left a park near snow-covered Mount Humphreys when I spotted the grove of aspens just off the road. Pulling as far off the road as I could, I hurried to get a shot before the sun faded or another car needed my half of the road. I took the photo with my Nikon Coolpix 5700, which gave me a lot of great photos in my first foray into digital. However, that camera doesn't allow for a lot of manual adjustment, so I felt lucky to get the exposure right. The sun was low in the sky, which softened the reflection off the snow, giving me just the right contrast. 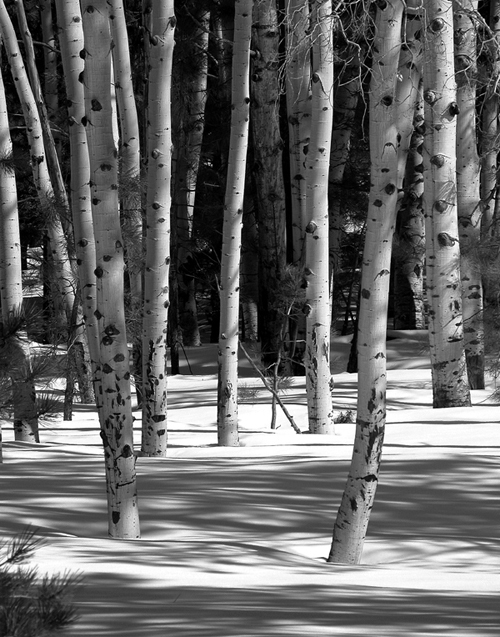 I liked the shot as I took it... the way the shadows played on the snow, and the clean look of the aspens against the darkness deeper in the woods. It's one of my favorites. But we had reservations on the South Rim, so we kept moving.